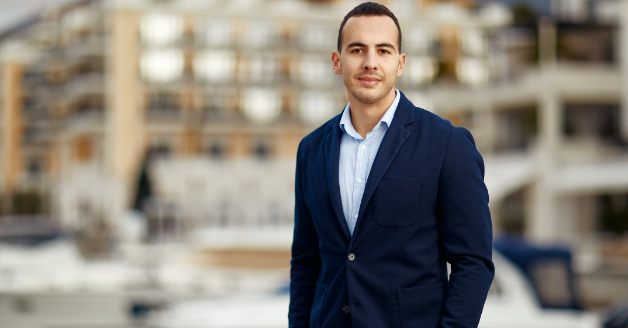 Corporate Digital Communications at Porto Montenegro are his bread and butter - he uses digital platforms to create and transmit a variety of marketing communications to both clients and media on both a local and global level. He approaches every task with passion, innovation and creativity, and for this reason was named the Employee of the Year representing the Marketing Department of Adriatic Marinas. Porto Montenegro has established its distinctive brand identity when it comes to digital presence. What are your thoughts on this, as the person behind the magic? Porto Montenegro is presented via various digital channels. I think the statistics speak for themselves - over 1m users search our brand name each year, whilst our website enjoys over 200k visits per annum. We have 80k followers on Facebook, over 50k on Instagram, whilst our LinkedIn and Twitter profiles enjoy a humble yet targeted following of 7k and 5k followers respectively. As the person sitting behind the digital communications, I focus on content placement on a daily basis to ensure this is adapted to the various mediums and channeled accordingly to the relevant target groups. In many ways, my role helps bind together the various offerings of the company – from promoting events or concerts in the Naval Heritage Collection, to informing clients of sale launches on new residential units. I strive to keep all of our communications in line with our brand standards and our identifiable "tone of voice" which we have built over the years. It is a great challenge to meet expectations, both internally and externally from our followers who are constantly seeking enticing new content. Monitoring all changes in the industry, digital trends and communication standards is imperative. Where a couple of years ago, the best way to promote visual was through photography, today, the balance tips in the favour of video, and so does this affect our approach to communications. You’ve received great feedback on the stunning new website. How challenging was it to create an informative, entertaining, interactive and aesthetic digital platform, whilst conforming to the principles of corporate communication? As the umbrella of all digital activity, the new website is thoroughly refreshing. We’ve managed to bring together all of the elements that characterise Porto Montenegro and convert this into a modern, visual and interactive digital presentation – I’m very proud of the outcome. As all digital reps know, a slick user experience is paramount and continuous improvement is certainly on our agenda. This involves creating user-friendly design and crafting a tailored user journey, as well as automating elements of the process. The goal of the site is to communicate what we do, what Porto Montenegro is about, and to enable users to reach their online destination as quickly as possible – whether this be textual information, brochures, enquiry forms, images, or something more. Among many objectives, one key initiative of the new website was to mark a new stage in the expansion of the company, presenting Porto Montenegro as an established development, open to innovation and global advances, and to publicise our ever-growing calendar of events and company news. The various social media channels such as Facebook, Instagram, and all other Porto Montenegro digital profiles enjoy vast public attention. Each medium communicates accordingly to its audience with charm, creativity and well-thought-out messaging. Do you have anything to add? Social networks are among the most important digital communication channels and it’s important to maintain an active and interactive relationship with followers. Each of these channels has a different target group, so on Instagram we promote the PM lifestyle and Montenegro as a destination, while the Montenegrin Facebook page is used to promote current affairs in the local community, LinkedIn for connecting with business partners, and so on. All visuals are branded and accompanying text is always written in a familiar tone of voice. I am proud to say that behind all of our network communications are a series of strategic approaches, devised by the entire marketing team. I receive input from my colleagues on respective topics (marinas, residential, events, PR) and then together with our in-house graphic designers, we prepare materials for publication. We view each social network separately, choosing our primary means of communication in relation to the target group we are addressing. Our Instagram profile of over 50k followers is in some way our ‘mood board’, portraying our view of Montenegro as a luxury destination, but also pitching PM’s position in the context of super-yachting. It is of great personal satisfaction to influence the status of the development and also promote the country through my work. I think we have a lot to offer in terms of luxury tourism and it’s great that my role contributes to this. Digital marketing is a growing domain and one that is often prone to the challenges of rapidly changing business dynamics. What are the current postulates and techniques for corporate digital communication? Digital marketing is perhaps the fastest growing business of today, but is also unpredictable - on one hand, we see changes in the ways we use digital tools, and on the other, we see changes in methods of communication; it is the latter which often has a great influence. As users, we are exposed to vast amounts of data on a daily basis which actually affects our perception of how we are being marketed to. Where we used to read physical books, today we choose digital versions or ever popular audio books. It’s the same with social networks – a few years ago, we read blogs, whereas now we turn more towards vlogs or podcasts, for example. To put it simply – there is an upward learning curve for all those working in digital marketing to continuously follow and keep up-to-date with global industry standards. In summary, I’d say it is necessary to continuously evaluate users’ queries, learn from their behaviour, track relevant trends and innovations, be creative and of course, keep track of analytics which are our richest source of information and insight.